The Smiling Lotus Wisdom Stupa is an Enlightenment Stupa dedicated to the Lotus Dakini Kurukulle. She is known as the Smiling Lotus Dakini. The Smiling Lotus Wisdom Stupa was hand-quarried from the active volcano Mount Merapi, Central Indonesia. The Stupa's composition is black lava rock. It has been masterfully carved by hand in the area of the world-renowned Borobubur Temple, Magelang, Indonesia, 2014. It arrived by boat to its seat in Hawai'i on Spring Equinox, 2015. Her home is within the fertile, lush, tropical jungle known as the Malama Ki Buddha Wisdom Garden. She lives within a highly activated lava zone in the district of Puna on the Big Island of Hawai'i, the Aloha State. As such, the Smiling Lotus Wisdom Stupa is located at the center of the Ring of Fire. The Smiling Lotus Wisdom Stupa. Today, The Smiling Lotus Wisdom Stupa remains in crates on this consecrated, sacred land. The time of consecrating this stupa is close at hand. A properly consecrated stupa -located here- shall provide the world's pilgrims a spiritual sanctuary for living in dharmic service to cultivating virtue, wisdom, compassion and true love while creating a steady flow of blessings now and into the future. On this fertile ground that is blessed as an indestructible basis of support, we actively aspire to firmly root the teachings of the Lotus-Born One's heritage. In order to complete this enlightening activity we request offerings of generosity to bring this living monument of Dharmic wisdom, love, and power to fullest fruition. "This is how it is here, at the womb of the world, where the elemental spirits of Fire -above and below- dwell in ever-fresh, spacious splendor's perfect harmony. The Smiling Lotus Dakini's natural display is the local protectress Tutu Pelema in molten flesh. 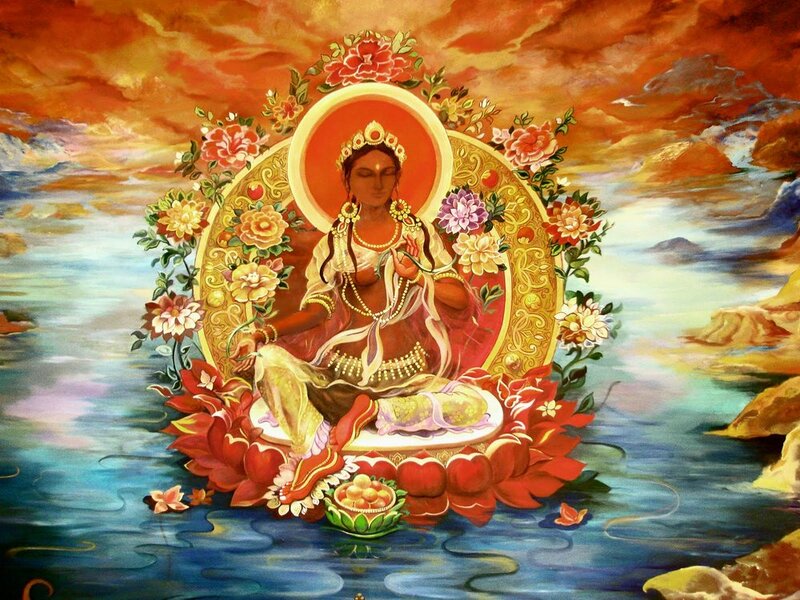 Mother Pele in her exalted form is none other than the self-arising activity of the Glorious Smoking Goddess, Palden Lhamo, herself. It is she who sustains and protects the teachings for the lasting benefit of all beings. Through the unceasing primal wisdom displays of these goddesses united, all according to capacity are guided along the luminous path of the Dakini Pureland." Receive Updates from the Smiling Lotus Ohana! It brings us joy to make new connections and we look forward to staying in touch.